Kidney stones occur when chemicals and certain materials found in urine come together and form crystals that connect to form a hard mass. These hard masses can be of different sizes ranging from a gold ball size to a grain size and can be jagged or smooth. These stones can lead to severe pain, more so when they block the flow of urine. However, it is possible to live with them unnoticeably as they may at times not cause any symptoms. These ‘silent’ kidney stones are mostly noticeable through x-rays. Uric acid stones are common amongst people who do not take enough fluids or those who lose too much fluid without replacement. These stones are also common in individuals who eat high protein diets and those suffering from gout. There are some genetic factors that can also lead to an increase in the likelihood of developing uric acid stones. Uric acid is a substance that is excreted from the body during the process of breaking of cells, which occurs after eating. Uric acid is a waste product that should be excreted from the body through stool and urine. When the kidneys fail to perform as they should, the uric acid will accumulate in the blood and results in kidney stones and gout. A simple laboratory test can determine the amount of uric acid in the urine. The uric acid kidney stones occur when there is too much uric acid in the urine, or when there is the normal amount of uric acid in a small amount of urine. They also occur when the uric acid present is in insoluble form. Uric acid is produced during the process of breaking up the purines in the body tissues. It is also present in foods such as peas, beans, liver and certain alcoholic drinks.When uric acid remains in the urine for too long, it can lead to the formation of uric acid stones. Gout. This is a condition that involves the deposition of uric acid in body joints that leads to joint pain. Also, the presence of uric acid in blood can cause gout. Diabetes. People suffering from type 2 diabetes have high acid content in their urine, which is a likely cause of uric acid stones. Like most other types of kidney stones, it is important for you to increase your intake of fluids when you are diagnosed with uric acid stones. Fluids can come in the form of plain water, coconut water, barley water, vegetable juices and fruit juices. You should take a minimum of 10 glasses of fluids each day, with half of that comprising of plain water. This increases the fluid levels and helps in diluting urine, decreasing acid levels and flushing of toxins out of the system. When you have too much uric acid in your body, you should avoid taking purine and protein rich foods. These foods include minced meat, meat, anchovies, asparagus, mushrooms, poultry and fish. You should also avoid gravies made from protein sources. Also avoid organ meat like liver, brain, kidney and heart. Sweetbreads are also rich in purine and thus should be avoided. Since your body still needs protein, you can get that from tofu, egg whites and dairy products. You should include milk and yogurt to your daily meals. They work well to reduce the amount of uric acid in the body and thus reduce the formation of kidney stones. Consume more fruits and vegetables and reduce the intake of yeast, alcohol, dry peas and beans, cauliflower, spinach, asparagus as well as mushrooms. Place more emphasis on consuming whole grains. This can be found in cereals, rice, pasta and wheat breads. Avoid too much fat, butter, oils, sugar and margarine. Precaution: It is always advisable to speak to your doctor before making any major changes in your diet. This helps in weighing the pros and cons of the type of treatment prescribed and possibly determine the best medication for you. Maintaining a healthy weight is also very important. For people suffering from kidney stones and are overweight, they should work on losing weight. Weight loss reduces the stress on the joints. Passing stones can cause pain. The doctor may recommend some pain relievers like ibuprofen and acetaminophen to relieve the pain. Medication can be prescribed to make it easy for the patient to pass the kidney stones in stool. This type of medication is referred to as an alpha blocker, which relaxes the muscles in the ureter making it easier to pass the kidney stones. When the kidney stones are too large to be passed, extracorporeal shock wave lithotripsy may be recommended. This process uses sound waves to create vibrations that break the kidney stones to smaller chunks that can be passed in urine. 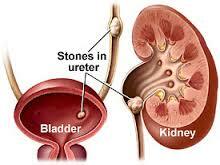 Percutaneous nephrolithotomy is a surgical process that can be used to remove kidney stones. It uses small instruments and telescopes that are inserted through the back. This involves the insertion of a small, lighted tube to the body through the urethra to the bladder and ureter. The stones are located and special tools are used to break the stones to allow passage through urine.